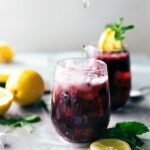 Easy and delicious sparkling blueberry lemonade. The perfect cool down summer drink! Around our home, the husband and I are a huge water drinkers. We rarely drink anything but water and milk. In fact, the husband is coming up on about 3 years of no soda. While I completely lack his self control, I don’t have soda all that often either. Because of this, pretty much by default, the toddler only drinks water and milk around home too. So, the other night when we went to some friend’s for dinner and Grey was offered some apple juice, he literally didn’t even know what it was. I’ve never bought him apple juice (am I the worst mom ever?!). He got a sippy cup filled with the juice and he inhaled it. It was gone in less than 5 minutes and he was begging for more. About four cups later and we cut him off, but I vowed to buy him some apple juice soon. Which, by the way, we now have two containers of apple juice in our fridge. The very first time I was introduced to blueberry lemonade was in a restaurant. As much as I love lemonade and blueberries, I don’t think I would have ever ordered it. However, because our food was taking an especially long time the server offered us free drinks. They had a poster somewhere in the restaurant with a picture of all of their flavored lemonades and the blueberry one instantly stood out. I ordered it and fell completely in love with blueberry lemonade. Ever since having that blueberry lemonade I’ve tried to re-create exactly how it tasted and I’ve finally got it down. This sparkling blueberry lemonade is incredible! It’s super sweet, a little tangy, and bursting with blueberry flavor. And yes, the toddler and I drank this all up in an afternoon. Which, I personally feel like makes up for the fact that he had apple juice for the first time in his life just a couple of weeks ago. This lemonade starts with making a blueberry simple syrup — just sugar, water, and of course blueberries. 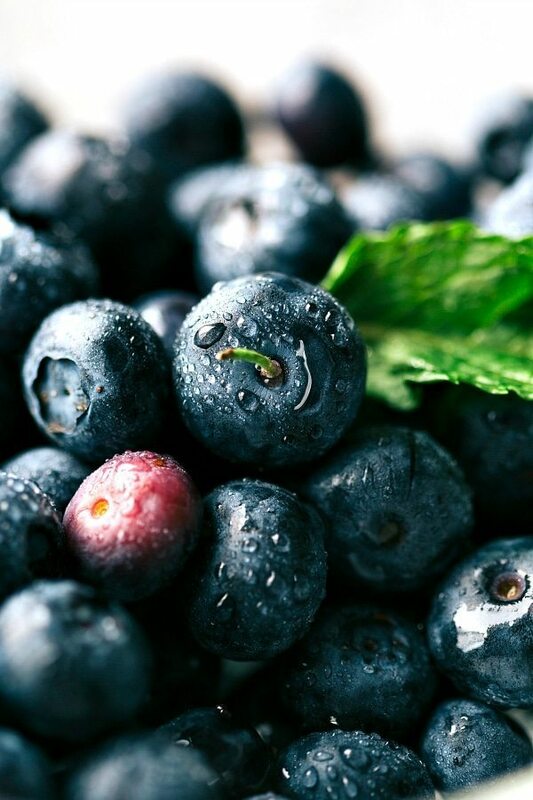 Once the berries have burst, you strain the mixture which becomes the blueberry syrup and base of this recipe. That syrup gets mixed with freshly squeezed lemons and sparkling water, and that is IT. Fill up a glass with some ice, fill it up with the best ever sparkling blueberry lemonade, and stay cool in that crazy heat! In a large pitcher, add the blueberry syrup, lemon juice, and ice. Stir together. If you don't plan on drinking this all in 1 day, keep the juice (blueberry syrup + lemon juice) separate from the sparking water. Add the two together as you want a cup of lemonade. This looks so very refreshing and quite easy to make, too!! Thanks for sharing — I’ll be making this one this weekend. Beautiful photos, too. Sparkling drinks are our favorite refreshment! This blueberry lemonade looks delicious! This looks so delicious and refreshing! My kids love flavored lemonades and always order them when we go out to eat but I’ve never made one at home before! I’ll have to try this! Chelsea I absolutely love your photos and have been following your blog for a while. I was wondering if you use a Lightroom preset for your pictures, and if you do, could you please tell me which one? Thanks! Thanks 😀 I’ll check it out! This looks so good! But because of where I live, I can’t buy fresh blueberries without paying a fortune, if we get any at all. Do you think this would work using frozen blueberries? I’m sorry; I’ve never tried frozen blueberries so I can’t say for sure! I don’t see why they wouldn’t work though! 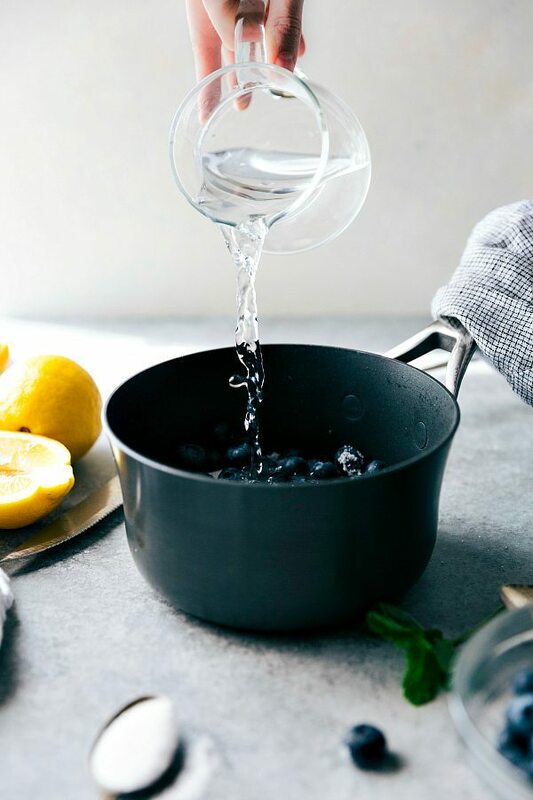 If making by the single glass, would you use equal amounts of juice and sparkling water? 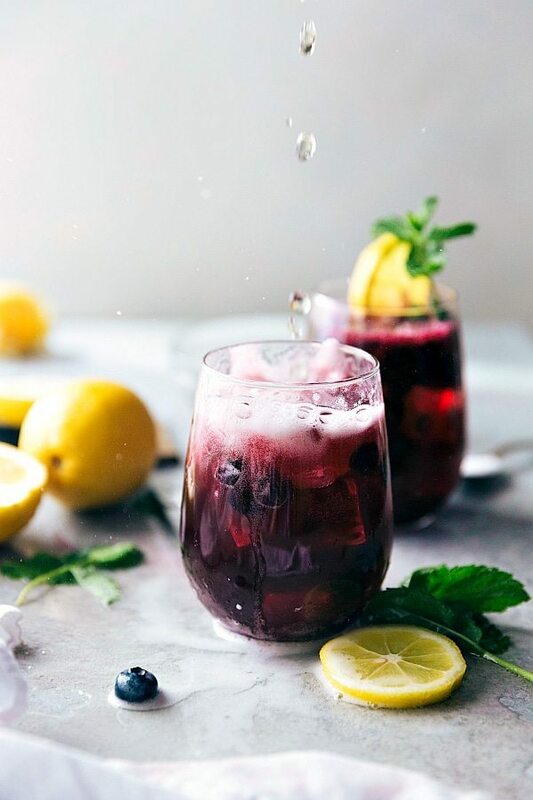 I am the same way when it comes to drink -water, coffee, wine occasionally but I think this summer I’ll make room for refreshing drinks such as this blueberry lemonade. Looks incredible! Can we freeze the blueberry syrup to be used after a few days? I am thinking about using this for a program that we do with girls in the summer, but I need to make it without sugar for a diabetic staff member. 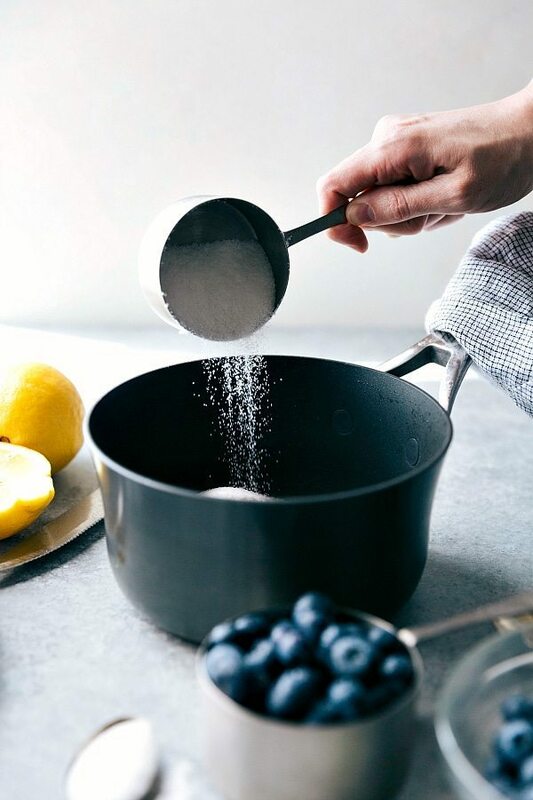 Can you use splenda or truvia instead of sugar? I’m sure you could! 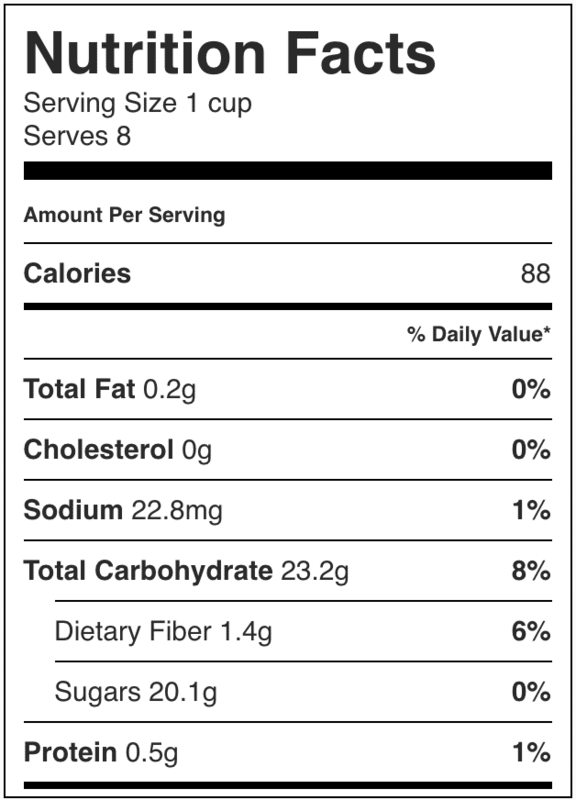 I haven’t tried alternative sweeteners, but if you scale it down based on the ratio of artificial sweetener to sugar, it should work great! I put up a lot of blueberries this past summer and they’re all in my freezer. I would like to use these blueberries to make the blueberry lemonade recipe. Since you mentioned using fresh blueberries I wonder if these blueberries that I put up would work as well. They should work ok! 🙂 Enjoy! I can’t have carbonation (no bubbles except occasionally) will this be ok with regular water? Yes, just fine! 🙂 Enjoy!